Bon Jovi: Wanted Dead Or Alive? Samuel Bartley Steele is a disgruntled Boston Red Sox fan and musician. In 2004 he penned (Man I Really) Love this Team and tried to sell it to MLS (Major League Baseball) and the Red Sox, for commercial use. 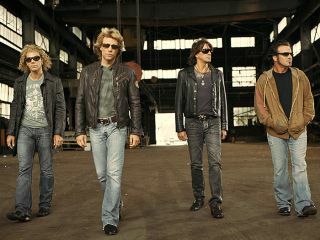 In 2007, Bon Jovi released Lost Highway, featuring the song I Love This Town, which was subsequently used for none other than an MLS promotional video. Steele claims the similarity between his baseball-themed track and Bon Jovi's is beyond coincidence. Now, he's attempting to sue the Bon Jovi camp for a staggering $400 billion. Yes, $400 billion. AntiMusic posted a copy of the plaintiff's case to 'explain' the figure: "Bart is requesting damages as authorized by the copyright law. As intent will be easy to prove, we are seeking the statutorily authorized amount of $100,000 per CD sold. Just under 4 million CDs have been sold to date. This totals almost $400 billion." A quick listen to Steele's original, and Bon Jovi's alleged offending article, offers little in the way of obvious "intent" to our ears. They're both thigh-slapping country rock, although Bon Jovi's is slightly more polished, as you'd expect. Steele: "Have you heard the news that's goin' round? Our hometown team is series-bound." That's why I love this town." Ignoring 'round', Mr Steele was unperturbed by the lack of similarity: "If somebody kidnapped my daughter and gave her a nose job and dyed her hair yellow and I saw her 20 years down the line, I'd know that was my baby - I knew this was my song." It's no secret that Bon Jovi employ third-party songwriters, so the idea of buying in a ripped-off song is plausible, if highly unlikely. Lost Highway's sleeve notes name Jon Bon Jovi, guitarist Richie Sambora and singer-songwriter Billy Falcon as equal contributors to I Love This Town.